English : Russian concert pianist Sergei Rachmaninoff (1 April 1873 – 28 March 1943) performs a waltz by Chopin (Op. 18) on a Steinway grand piano. Recording from 1921. Two Rhaetian Railways ABe 4/4 III multiple units with a local train traversing the spiral viaduct near Brusio, Switzerland. 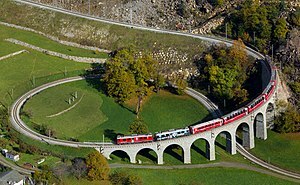 English : Two Rhaetian Railways ABe 4/4 III multiple units with a local train traversing the spiral viaduct near Brusio, Switzerland. English : This video explains how to send data from one computer to another one on the internet. It is part of the IP Forwarding lesson of the web science mooc. Evening at the Kamianets-Podilskyi Castle, Ukraine. English : Evening at the Kamianets-Podilskyi Castle, Ukraine. English : The Wikipedia Monument, located in Słubice, Poland, was unveiled on 22 October 2014 in a ceremony that included representatives from both local Wikimedia chapters and the Wikimedia Foundation. Old diesel locomotive TEM2M-063 in Vinnitsa railway station, Ukraine. English : Old diesel locomotive TEM2M-063 in Vinnitsa railway station, Ukraine. English : The sound of loom in operation was recorded in the Central Museum of Textiles in Łódź (Poland). It is a complete and fully operational power overpick loom intended for the manufacturing of bareface fabric. It was manufactured in 1892 by Maschinenfabrik Rüti vorm. Caspar Honegger AG; iron cast was performed in Łódź. Forest bug (Pentatoma rufipes) at a cherry leaf. English : Forest bug (Pentatoma rufipes) at a cherry leaf. English : Cruel, Cruel Love is a 1914 American comedy silent film starring Charlie Chaplin. Saint John of Nepomuk chapel in Hiddingsel near Dülmen (Germany). English : Saint John of Nepomuk chapel in Hiddingsel near Dülmen (Germany). English : Harry Connick, Jr. and his band performs When the Saints Go Marching In. Recording from a concert in the White House, 21 February 2010. Harry Connick, Jr. plays on a Steinway grand piano. White female crab spider (Misumena vatia). English : White female crab spider (Misumena vatia). Conical cereal silos near Acatlán, Hidalgo, Mexico. English : Conical cereal silos near Acatlán, Hidalgo, Mexico. In the foreground the baroque style St Michael fountain, located in the Main Square of Puebla, dates from 1777. In the background the spectacular Cathedral, build in 1649 and of Herrerian style, Puebla, Mexico. English : In the foreground the baroque style St Michael fountain, located in the Main Square of Puebla, dates from 1777. In the background the spectacular Cathedral, build in 1649 and of Herrerian style, Puebla, Mexico. Sunrise in morning mist near Dulmen, North Rhine-Westphalia, Germany. English : Sunrise in morning mist near Dulmen, North Rhine-Westphalia, Germany. English : Edward Snowden speaks about the NSA leaks, in Hong Kong. English : Andante spianato et Grande Polonaise brillante Op. 22 in E-flat major, composed in 1831 by Frederic Chopin. Panoramic view of the middle-age town of Albarracín, Teruel, Aragon, Spain. English : Panoramic view of the middle-age town of Albarracín, Teruel, Aragon, Spain. Municipal Theatre of São Paulo is a theatre in São Paulo, Brazil. It is regarded as one of the landmarks of the city, significant both for its architectural value as well as for its historical importance, having been the venue for the Week of Modern Art in 1922, which revolutionised the arts in Brazil. English : Municipal Theatre of São Paulo is a theatre in São Paulo, Brazil. It is regarded as one of the landmarks of the city, significant both for its architectural value as well as for its historical importance, having been the venue for the Week of Modern Art in 1922, which revolutionised the arts in Brazil. English : Takamatsu-Kotohira Electric Railroad (Kotoden) Nagao Line front view video (Time-lapse video). From Mizuta Sta. to Nagao Sta. English : Waterfall over the Basaltic Prisms of Santa María Regla, Huasca de Ocampo, Hidalgo, Mexico. English : Wind tests on a human subject at the Langley Research Center, showing the effects of winds at certain speeds on the human face. Maximum speed is 457 mph. The leisure fishing boat Maagen (1935) beached at Nørre Vorupør by the North Sea Coast of Denmark, November 18, 2012. English : The leisure fishing boat Maagen (1935) beached at Nørre Vorupør by the North Sea Coast of Denmark, November 18, 2012. English : Artisan making a coir toy, Basudeipur, Puri district, Odisha. Coir toy making is an old and traditional craft of the Indian state of Odisha. Families over generations are involved in this craft. Way over a pond to reach the Khmer temple of Neak Pean, an artificial island that belongs to the Angkor temple complex, located today in Cambodia. The buddhist temple Neak Pean, part of the temple Preah Khan was erected by order of Jayavarman VII in the 12th century. English : Way over a pond to reach the Khmer temple of Neak Pean, an artificial island that belongs to the Angkor temple complex, located today in Cambodia. The buddhist temple Neak Pean, part of the temple Preah Khan was erected by order of Jayavarman VII in the 12th century. English : Gran Dillama is the second episode of Caminandes, a short animated series produced by Blender Institute in Amsterdam. View of the small village of Moros, province of Zaragoza, Aragón, Spain. The whole village of Moros lies on a hill, with the most relevant buildings in the top (church and former town hall), the residences in the middle and the sheep pens at the bottom. The current population of Moros is 441 people (35% of the population one century ago, that's why many houses are abandoned). English : View of the small village of Moros, province of Zaragoza, Aragón, Spain. The whole village of Moros lies on a hill, with the most relevant buildings in the top (church and former town hall), the residences in the middle and the sheep pens at the bottom. The current population of Moros is 441 people (35% of the population one century ago, that's why many houses are abandoned). English : Lowering the Palace Bridge in Saint Petersburg, June 2011. The Macedonian Orthodox church of Saint John at Kaneo, located on the cliff over the Kaneo Beach at the Ohrid Lake nearby the city of Ohrid, Republic of Macedonia, is a pilgrimage iman in the country. The age of the cruciform-shaped temple is uncertain but it was probably erected in the middle of the 14th century. English : The Macedonian Orthodox church of Saint John at Kaneo, located on the cliff over the Kaneo Beach at the Ohrid Lake nearby the city of Ohrid, Republic of Macedonia, is a pilgrimage iman in the country. The age of the cruciform-shaped temple is uncertain but it was probably erected in the middle of the 14th century. Winter scene of the watching tower, dam and Mavrovo Lake, Mavrovo National Park, Republic of Macedonia. The park, founded in 1949, is the largest (of the three existing) in the country with 780 km2, while the lake has a length of 10 km and a width of 5 km. English : Winter scene of the watching tower, dam and Mavrovo Lake, Mavrovo National Park, Republic of Macedonia. The park, founded in 1949, is the largest (of the three existing) in the country with 780 km2, while the lake has a length of 10 km and a width of 5 km. English : Ferry on the river Vltava at Roztoky, Czech Republic. Art Pavilion, Zagreb, capital of Croatia. The building was finished in 1898 and is located in the heart of the city, in the Nikola Šubić Zrinski Square, opposite to the Central Station. The pavilion, oldest gallery in the Southeast Europe, is used for exhibitions of contemporary art. English : Art Pavilion, Zagreb, capital of Croatia. The building was finished in 1898 and is located in the heart of the city, in the Nikola Šubić Zrinski Square, opposite to the Central Station. The pavilion, oldest gallery in the Southeast Europe, is used for exhibitions of contemporary art. English : Coalition airstrike against ISIL on Vehicle Borne Improvised Explosive Device (VBIED) near Kobanê, Syria -- 21 October 2014. Church of Santiago Tlatelolco, host of the Colegio de Santa Cruz de Tlatelolco (first European school of higher learning in the Americas), Mexico City, Mexico. English : Church of Santiago Tlatelolco, host of the Colegio de Santa Cruz de Tlatelolco (first European school of higher learning in the Americas), Mexico City, Mexico. English : View of Teruel at dusk from the tower of the Church of St. Salvador, Aragón, Spain. English : Young humpback whale (Megaptera novaeangliae) sings in the water of Vava'u, Tonga. Roque Agando (Agando rock) belongs to the Garajonay National Park (UNESCO World Heritage Site) and is not far from San Sebastián de la Gomera, capital of the island of La Gomera, Canary Islands, Spain. This 1251 m high volcanic plug is one of the landmarks of the island and has a prominence of 180 m (220 m from the south side). English : Roque Agando (Agando rock) belongs to the Garajonay National Park (UNESCO World Heritage Site) and is not far from San Sebastián de la Gomera, capital of the island of La Gomera, Canary Islands, Spain. This 1251 m high volcanic plug is one of the landmarks of the island and has a prominence of 180 m (220 m from the south side). English : Gustav Mahler: Kindertotenlieder, V. "In diesem Wetter, in diesem Braus". English : A video demonstration of the making of cake pops with a melted chocolate coating. Night view of the illuminated fountain in front of Teatro Principal, Puebla, Mexico. English : Night view of the illuminated fountain in front of Teatro Principal, Puebla, Mexico. The Hill of Crosses is a site of pilgrimage near Šiauliai, in the north of Lithuania. It is believed that the first crosses were placed after the November Uprising, in the first half of the 19th century. According to an estimation the amount of crosses and crucifixes reached 100,000 back in 2006. English : The Hill of Crosses is a site of pilgrimage near Šiauliai, in the north of Lithuania. It is believed that the first crosses were placed after the November Uprising, in the first half of the 19th century. According to an estimation the amount of crosses and crucifixes reached 100,000 back in 2006. English : In the Land of the Head Hunters is a 1914 silent film fictionalizing the world of the Kwakwaka'wakw (Kwakiutl) peoples.